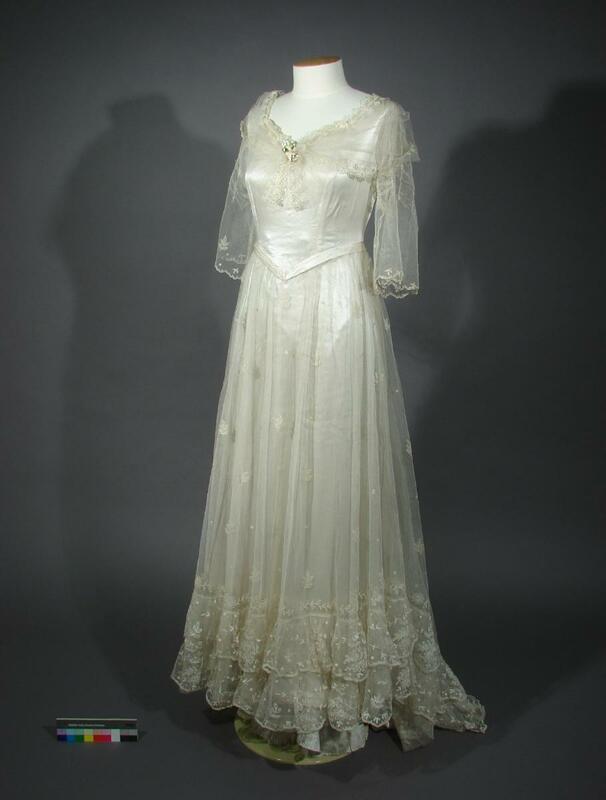 This wedding dress was worn by Rachel Hepburn in 1868 but significantly remodelled for a descendant to wear in 1934. The dress no longer presents the style of 1868 but the veil, of Limerick lace, is still in original condition. This was a gift to the bride from her chief bridesmaid. The selection of white as the colour, a wedding fashion associated with the royal family in Britain, is evident in only a few of the wedding dresses from this period in the Museum's collection. Most of these belonged to women from a relatively wealthy background. Rachel Hepburn came to Otago from Scotland as a four year old in 1850 on the Poictiers. She was the third daughter of George Hepburn, a Presbyterian pioneer prominent in Dunedin’s First Church congregation and later in Knox Church. He represented Wakari in the Otago Provincial Council and in 1868 had just been elected to parliament for Roslyn. Rachel’s wedding was a grand affair, held at her father’s home in Halfway Bush and celebrated by the Rev Donald McNaughton Stuart. Her husband, William Downie Stewart, was an aspiring young lawyer who had recently established his own legal practice in Dunedin. He went on to a highly distinguished career in the law and as a politician. Rachel, however, died in 1878, the year William was first elected to parliament. She left behind four children, each of whom became prominent in public life.